Aerial map of the Meadowcrest Ridge Firewise USA site. 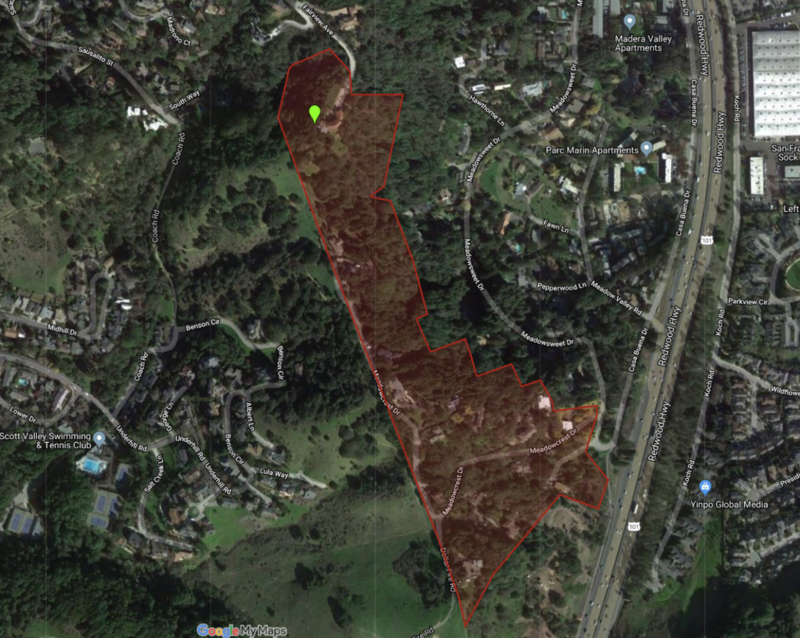 It is with great pleasure that we welcome Meadowcrest Ridge (Corte Madera) to the growing number of Firewise USA sites, where residents throughout the nation are working to reduce their wildfire risks. Marin county leads California in the number of recognized Firewise sites, and leads the nation in growth of this important program. The 25 acre Meadowcrest Ridge neighborhood in Corte Madera is an incorporated development which includes approximately 17 homes. Meadowcrest Ridge is comprised of all homes from 1135 Meadowcrest Drive (a private drive) through 1200 Meadowcrest (our home) and includes 40 Fairview Avenue, a 7 acre parcel to the north. Meadowcrest neighbors created a Firewsie committee in 2018, completed a written risk assessment, help educational events and worked to reduce hazardous vegetation around their homes. The Firewise USA Program encourages local solutions for safety by involving homeowners in taking individual responsibility for preparing their homes from the risk of wildfire. The program provides resources to help homeowners learn how to adapt to living with wildfire while encouraging and empowering neighbors to work together to take action now to reduce their wildfire risk and prevent losses. Join the growing network of more than 1,400 recognized Firewise communities taking action and ownership in preparing and protecting their homes against the threat of wildfire.